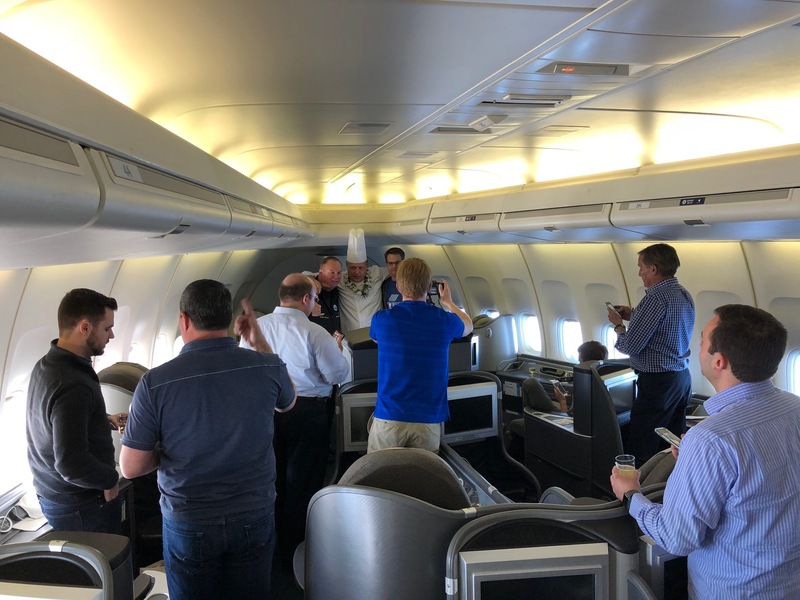 On Tuesday, United Airlines flew the last commercial flight for its Boeing 747-400 aircraft, marking the end of an era for the Chicago-based airline. 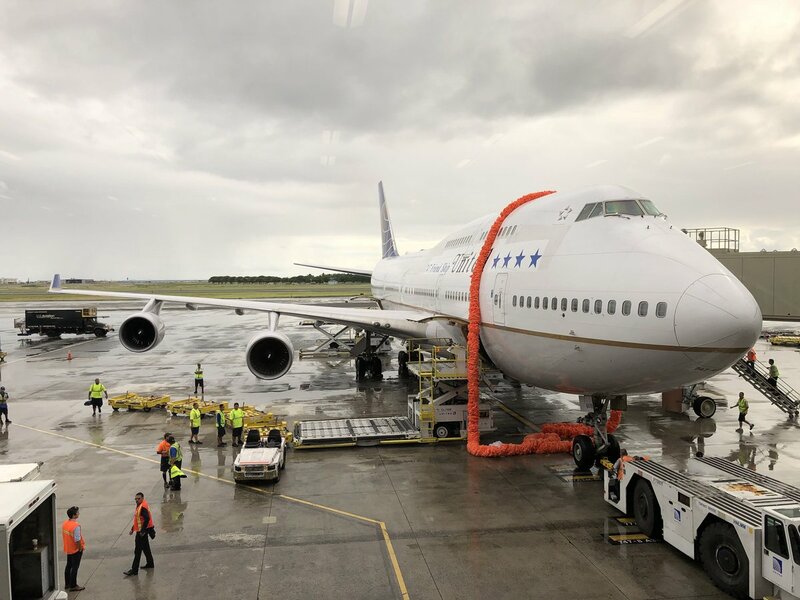 The iconic jumbo jet, lovingly referred to as the “Queen of the Skies” by the aviation community, flew its last flight for United from San Francisco to Honolulu, Hawaii as UA flight 747. The 2,400 mile long flight from the U.S. mainland to the 50th state not only traveled across time zones but also traveled back in time. The last flight for the four-engine wide-body was a throwback flight, recreating the first revenue 747 flight for the airline back in 1970. The flight was made complete with retro uniforms for the flight attendants, a 1970s-themed menu for food and 1970s-themed inflight entertainment. The aircraft (N118UA) was also an ode to the past, featuring a decal of the airline’s iconic “Friend Ship” livery used on the jet’s first flight. Leading up to the final flight, N118UA operated several employee flights at United’s major hubs around the U.S. This particular 747 is fairly young, only having entered service with United in 1999. 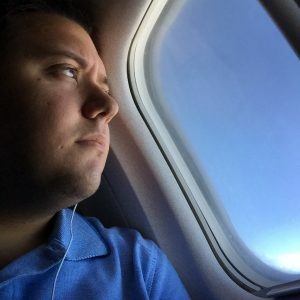 At only 18 years old, United is retiring it. However, this airplane has most likely flown to more places than most people will visit in a lifetime and has earned its retirement, serving United with distinction for almost two decades. In the early 1960s, President Kennedy spoke about the need for supersonic transport (SST). Most aircraft manufacturers were convinced that supersonic aircraft were the wave of the future and that a large, bulky double-decker aircraft would be rendered obsolete once an SST passenger aircraft was developed. However, Boeing continued with the 747 program, confident in its potential success either in the passenger or cargo realm. Had it not been for Juan Trippe and his Pan American Airways, we might never have had the 747. Pan Am had seen success for the similarly four-engine Boeing 707 aircraft, but it needed something bigger. Trippe tasked Boeing with providing an airplane for the airline that could carry at least double the amount of the 707. 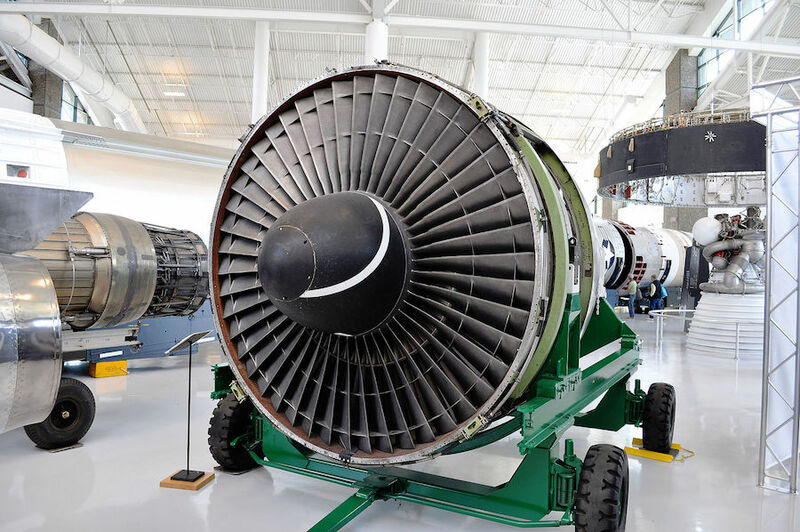 When the airplane was being developed, Boeing aircraft engineer Joseph “Joe” Sutter, dubbed the “Father of the 747,” was transferred from the successful 737 development team to work on this potentially game-changing aircraft. Sutter transferred to the 747 development team in 1965. By 1966, Pan Am had placed an order for 25 747-100s, valued at $525 million. The first prototype of the aircraft, named “The City of Everett” after the location of the production plant, was first rolled out in 1969. The aircraft was painted in Boeing factory paint featuring the logos of the airlines that placed orders for the 747, including United. Less than a year later, and less than 20 years after the first commercial jet aircraft flight, the 747 took to the skies for the first time, changing the aviation industry forever. The new airplane was advertised as being able to carry 490 passengers, well more than double the capacity of the 707. Pan Am, as the launch customer, was able to influence some of the design features for the aircraft, shaping the way the aircraft is today. The Boeing 747 has been a staple of American aviation ever since, trailblazing new paths in international and luxury travel. For many, the Boeing 747 represented luxury in the sky. Most airlines operating the 747 used its signature hump, the upper-level of the double-decker, as a private bar and lounge for its passengers. The bar was a place for passengers to relax, mingle and have a drink during their long flights. At the time, the 747 was operating some of the longest routes in the world. Virgin Atlantic maintained the upper-level bar in its first class cabin. Only four years after Boeing announced the 747 program did United receive its first 747. 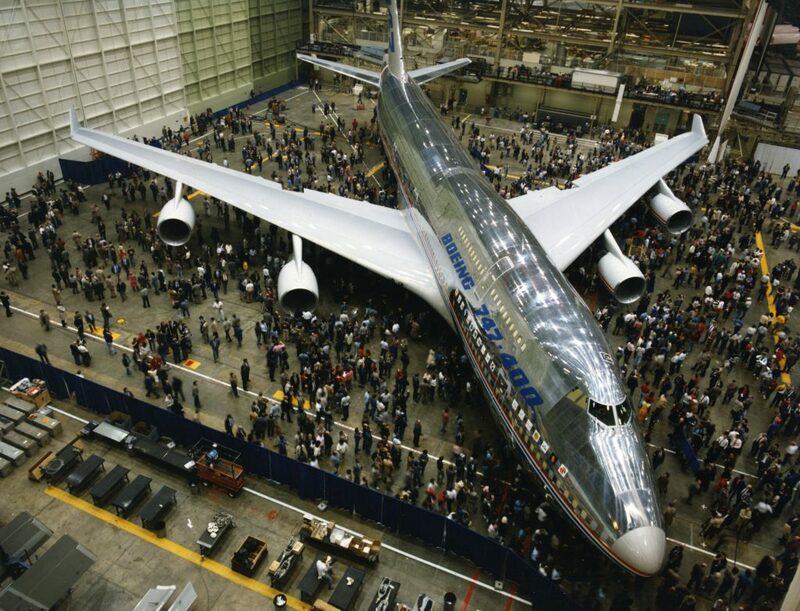 June 26, 1970, was the date that United received and welcome its first quad-engined wide-body into the fleet. Less than a month later on July 23, United flew the first revenue flight for the aircraft to Honolulu, which the final flight sought to recreate. Since 1970, Boeing enhanced the 747 multiple times. In 1971, only two years after the first flight of the 747-100 did Boeing release the 747-200 series. The 747-200 was made available in passenger, cargo, and a mixed configuration. Boeing continued to enhance the plane, producing the 747SP, 747-300, 747-400 and 747-8. The aircraft soon became a status symbol for many airlines. For most, the aircraft became the flagship of their respective fleets. Airlines such as United Airlines, British Airways, Lufthansa, Northwest Airlines, Qantas, Continental Airlines, El Al, KLM Royal Dutch Airlines, Korean Air, Trans World Airlines, Air France, and Pan American World Airways all used the 747 as the jewel in their crowns. The 747 had become an institution, recognized all over the world for its size, its beauty, and its grace. A head-turner for sure, the aircraft had established its dominance in the skies. Even those with no interest in aviation knew what a 747 was and could recognize it among other aircraft at any airport in the world. One of the world’s greatest engineering feats, most passengers knew they were onboard a marvel. Despite its retirement by most commercial airlines, the 747-200 is widely known today as the aircraft that flies the President of the United States. The VC-25 is the U.S. Air Force equivalent of the 747-200, specially equipped for VIP operations for the President, top-level officials in the U.S. Government, and members of the press. The Air Force has two VC-25s in service, both serving the President and his staff. Flying as callsign “Air Force One” when the President is aboard, the airplane is known around the world as the airplane that flies the leader of the free world. The majesty of the blue and white paint with gold trim, the grace of the American flag on the tail and the big, black, all-capital lettering on the side of the plane reading “United States of America” make the plane the most recognizable in the world. 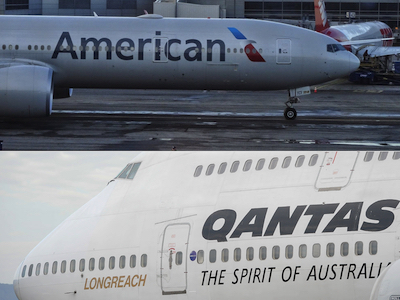 The plane itself is, perhaps, America’s greatest ambassador. The ultimate symbol of American power, diplomacy, and authority, the flying White House commands respect everywhere it goes. 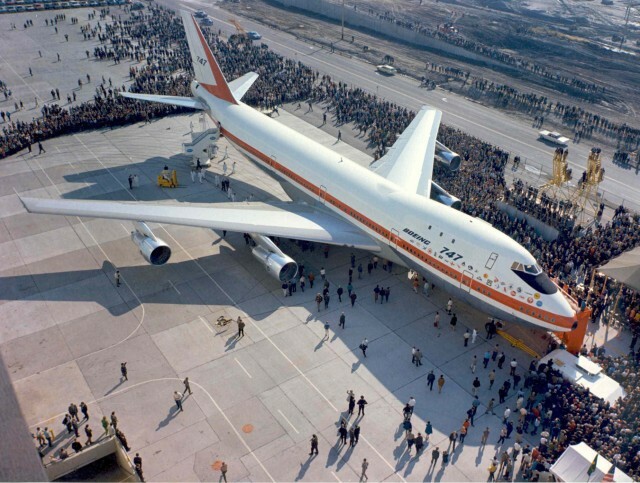 In its tenure, the Boeing 747 had become a testament to the beauty of American engineering, displaying ingenuity, expertise, and innovation to every exotic locale and international airport the Queen went to. At a time when the country was vying for the favor of the world’s nations in opposition to the USSR, every 747 flight served as a goodwill flight showing that America was a force for good in the world, while also displaying strength. Wherever the 747 went, it represented America. In September 2017, United announced that Nov. 7, 2017, would be the date of the final flight for the carrier’s 747. The last flight comes 47 years, 3 months, 2 weeks and 1 day after the airline’s first 747 flew in 1970. The plane served United honorably, acting as the backbone of the international fleet. Flying popular routes such as San Francisco to Frankfurt, Seoul, Beijing, and Tokyo, United’s 747 fleet exemplified the original purpose of the aircraft. The final flight, United flight 747, sold out within a matter of hours. Hundreds of aviation enthusiasts, airline employees, media and other travelers all lined up to give the aircraft a proper farewell. United reserved the upper deck so that it could be enjoyed by all passengers during the near 6-hour flight. 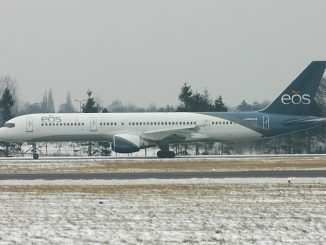 The airline also gave a few lucky passengers in Polaris and business class the opportunity to sit in the upper deck. During high-travel seasons, United placed the 747 on strategic domestic routes. 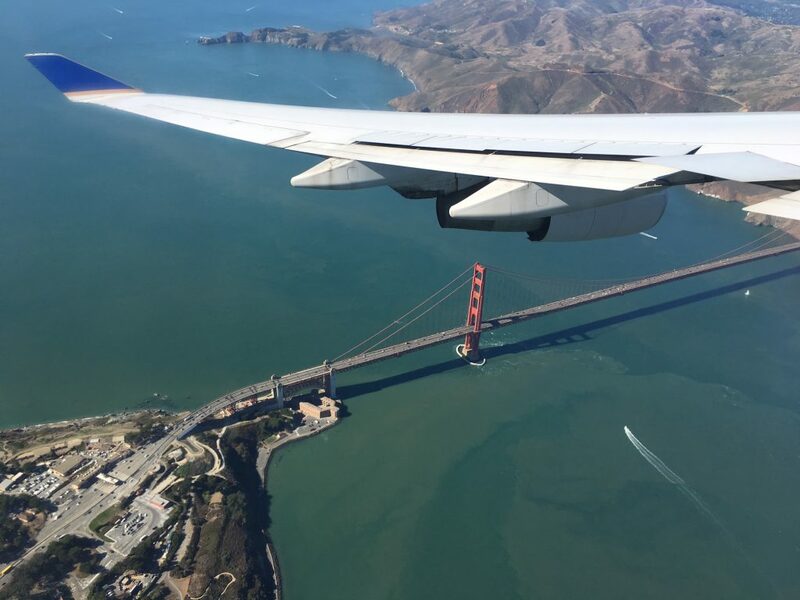 One would most likely find the 747 flying between United’s San Francisco and Chicago hubs, serving as repositioning flights and taking advantage of the aircraft’s unused time on the ground. By placing the international aircraft on domestic routes, many aviation enthusiasts were able to fly on the aircraft, if only on a 4-hour flight. United is just the latest airline following in a trend of carriers retiring their older, quad-engine aircraft in favor of sleeker, fuel-efficient double-engine aircraft such as the Boeing 777 and Boeing 787. The celebrations began in the morning at SFO’s gate 86 with celebrations, including an announcement by the flight’s captain and photo opportunities with the cabin crew along with a card for employees to sign. Roughly 300 passengers boarded the flight, with the airline’s CEO Oscar Munoz, scanning boarding passes. While taxiing to the runway, a pitstop at maintenance was made to repair the aircraft’s air conditioning unit. Despite this, United flight 747 took off just a few minutes behind schedule. 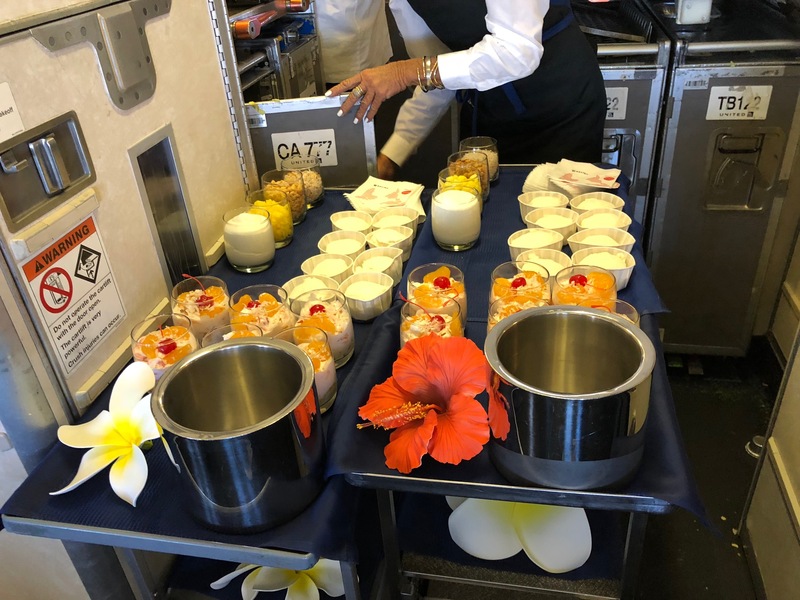 Retro-themed menus and cocktails made their rounds as the inflight party kicked off enroute to Honolulu. Soon after takeoff, flight attendants sprung into action getting our delicious food ready and offering us a selection of drinks from the bar cart. This being a special flight, there was a one-off menu provided for economy and premium cabins. We started off with a Mai Tai and a cocktail snack of pork wonton and coconut shrimp. Drinks were refreshed along with the appetizer, and grilled shrimp and papaya mint relish with a salad was served. 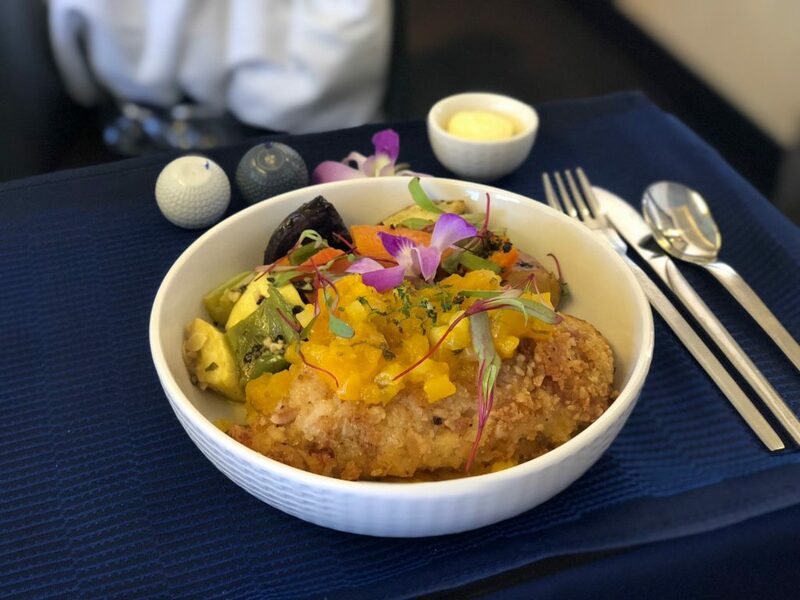 Three entree choices were available in the premium cabins: smokey bacon-wrapped grilled tenderloin, chicken with macadamia nut crust, and grilled mahi-mahi with jumbo lump crab. After enjoying all that great food we were asked if we wanted dessert and since calories don’t count in the sky, especially on a 747, we went for it. The two options were luau ambrosia parfait and the signature sundae service served from the trolly with all the toppings. In economy, passengers started with macadamia nuts and a cocktail, cold shrimp cocktail and salad. They had the option of either the braised boneless beef short ribs or the grilled shoyu hibachi chicken as their entree. The same dessert service in the premium cabins was provided to all economy passengers. After landing at 3:06 p.m. local time in Hawaii, N118UA was met with more celebration at the gate area, including a 120-foot lei, which was designed by United employees. It would be the last time that the airplane would carry paying customers for United. The 747 will continue to live on outside of United Airlines. Delta Air Lines is still operating their fleet of jumbo jets, mainly based out of Detroit and used on their long-haul international routes. However, those are also scheduled to be phased out by the end of 2017. 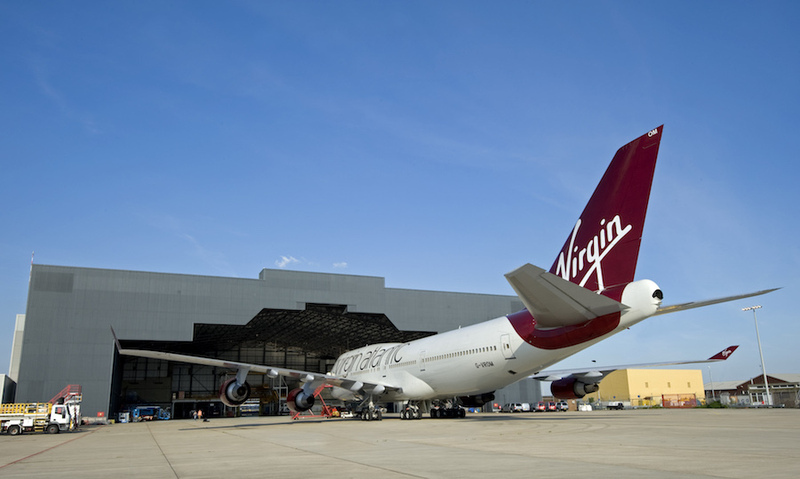 By 2018, there will be no U.S. carriers operating a 747 on scheduled passenger routes. 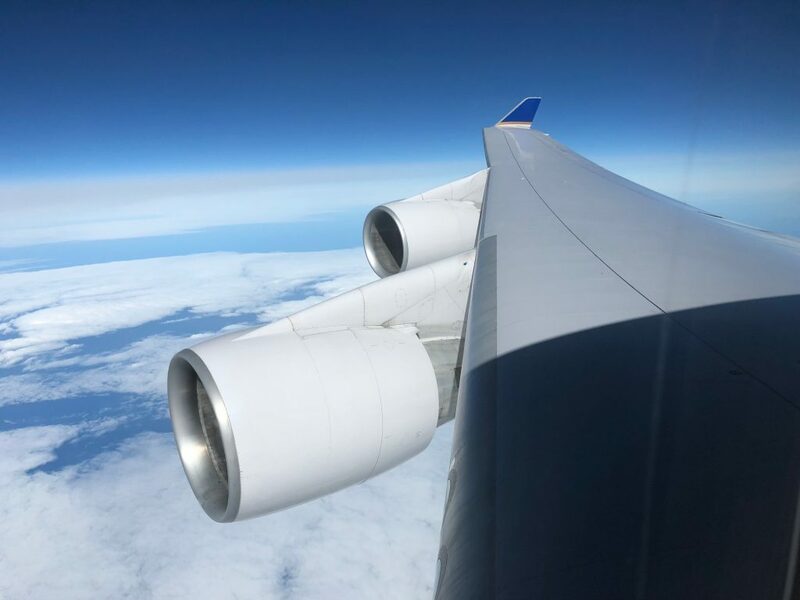 The aircraft’s newest family member, the 747-8, is still in its infancy, crisscrossing the globe either as a passenger-liner or a cargo freighter. Airlines like Air China and Lufthansa, as well as cargo airlines such as Cargolux and Nippon Cargo, now carry the torch and keep the 747 flying. The Air Force also plans to use the 747-8 as the next Air Force One, replacing the aging 747-200. 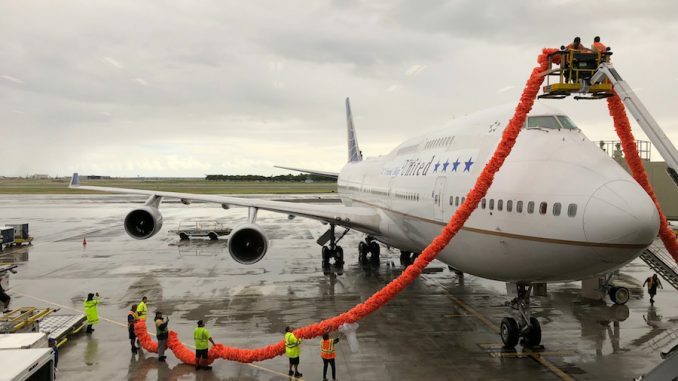 While the retirement of this aircraft marked the end of an era for the airline, the Queen was surrounded by her friends and family in both San Francisco and Honolulu all there for one reason: to say mahalo to United Airlines’ Boeing 747.